At the "It's Show Time" media event held earlier today at the Steve Jobs Theater in Apple Park, Cupertino, Apple took the wraps off the highly anticipated Apple News+ subscription service, which will allow users to gain access to over 300 magazines inside Apple News for a single monthly fee of $9.99. Unlike the other services announced by the company at the event, Apple News+ is available now in the United States and Canada as part of the iOS 12.2 and macOS 10.14.4 software updates. Apple kicked off the presentation of Apple News+ noting how, in the years since Apple News launched, the company has assembled a team of editors and curators to ensure the free service could be seen as a trusted news source by customers. Apple touted the fact that over 5 billion articles are read in Apple News each month, and that, by combining editorial curation with on-device machine learning, the Apple News app can cater to a variety of interest and promote in-depth journalism without intruding users' privacy. 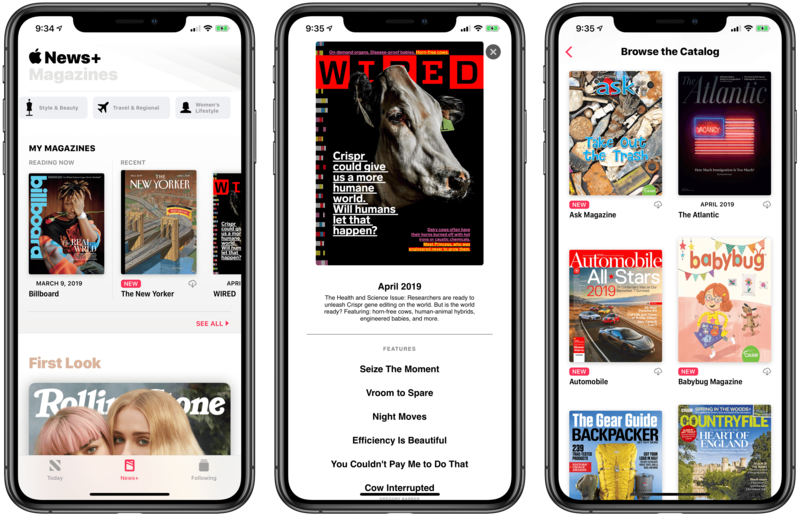 The next step for Apple News is a subscription product that will give iOS and macOS users access to over 300 magazines that can be read cover-to-cover inside Apple News. Stressing the power and cultural impact of journalism with a "Quality journalism matters" tagline, Apple introduced Apple News+ as an all-in-one package that, in addition to the free Apple News service, comes bundled with a large selection of magazines for all tastes and interests, from People and Wired to Sports Illustrated, Vogue, Scientific American, and The New Yorker. Additionally, Apple announced that two leading American newspapers, The Los Angeles Times and The Wall Street Journal, will be available through Apple News+ to subscribers – even though it's not clear whether the WSJ will actually offer the entirety of its content on Apple News+ yet. Furthermore, Apple News+ will also host digital publications such as Vox, theSkimm, and TechCrunch, which will offer paywalled content to Apple News+ subscribers. Vox has more details on their Apple News+ offering here. 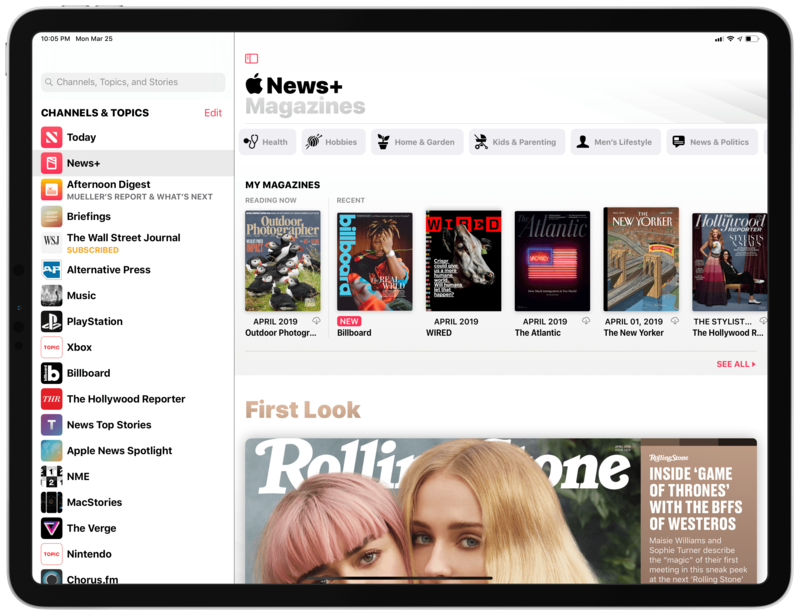 Here's how Apple News+ will work: after subscribing (and the first month will be free for everyone), the News app will gain a News+ section where you will be able to access all the magazines offered by Apple News+. The News+ tab replaces the Digest section, which, however, remains available either via integrations in the For You page or the standalone section in the 'Following' area of the app. In the News+ tab, you'll find a collection of all the magazines you're reading now, multiple categories to choose from for deeper exploration (such as Business, Cars, Food, Lifestyle, etc. ), and cover stories handpicked by Apple News editors. 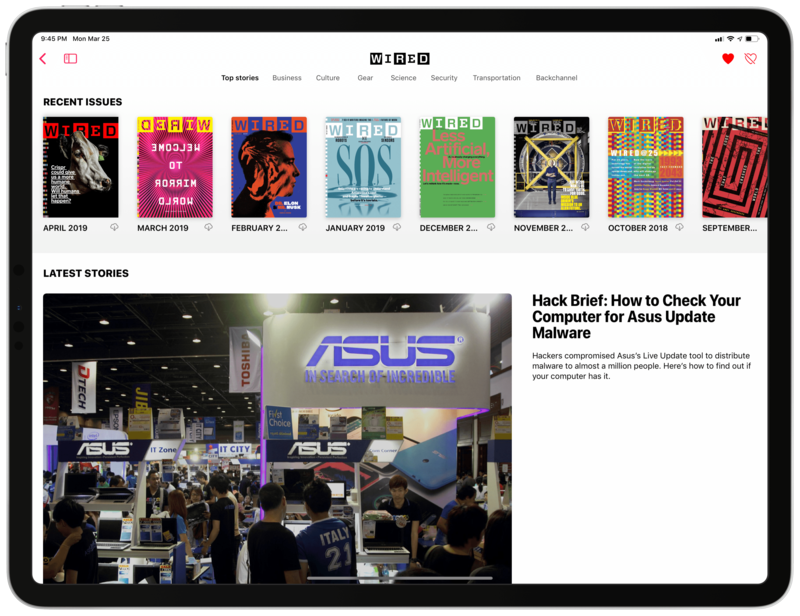 Recent issues of your favorite magazines are automatically downloaded offline so you can read them anywhere you want, too. The main page of Apple News+. According to Apple, while it'll be possible to browse the entirety of Apple News' magazine catalog in the dedicated News+ tab, recent issues and individual stories tailored to your tastes and reading habits will also be recommended in the For You section of the app alongside other existing content from Apple News. Essentially, this means that you will be able to, say, read articles from MacStories and an issue of Wired magazine from the same section of the News app. As for what the magazines actually look like, some publishers have decided to fully optimize their content for the Apple News Format, while others have opted for a traditional PDF-like presentation mode reminiscent of the service upon which Apple News+ is based – Texture, which Apple acquired last year. In today's demos and marketing materials, Apple showed a roster of beautifully-formatted magazines that featured live animated covers, edge-to-edge photography, rich layouts with reflowing text and media embeds that scaled for mobile devices, and various interactive elements. I was able to sign up for an Apple News+ subscription earlier today, and I spent some time reading magazines in the new section of the app. Currently, magazines offered by the service are a mix of rich, responsive content based on Apple News Format and fixed, high-resolution "scans" that behave like pages of a PDF document. I was happy to see that the majority of magazines I'm interested in such as Wired, Rolling Stone, and The New Yorker have been built with Apple News Format, which brings a host of advantages: layouts are richer (with animated elements, swipable galleries, and more), text can be resized, and each issue offers a Table of Contents that lets you jump directly to a specific story or section of the magazine. Magazines, built using Apple News Format, in Apple News+. Opening an individual publication's page will show you past issues of the magazines that can be read in Apple News+. The same page can combine website stories with magazine issues. The adoption of Apple News Format also means that individual stories can be shared (with an Apple News link) and that Apple News editors can recommend specific stories that take you directly into the magazine to read them. In fact, my front page of Apple News+ is currently filled with such recommendations for stories about Game of Thrones, tips on travel, comedy, and scientific breakthroughs. Publishers that implement the Apple News Format will therefore gain higher visibility in Apple News+ because the app will be able to recommend and point users to individual stories within magazines. Other magazines, however, have not been designed with Apple News Format, and thus feel like a legacy product carried over from Texture. 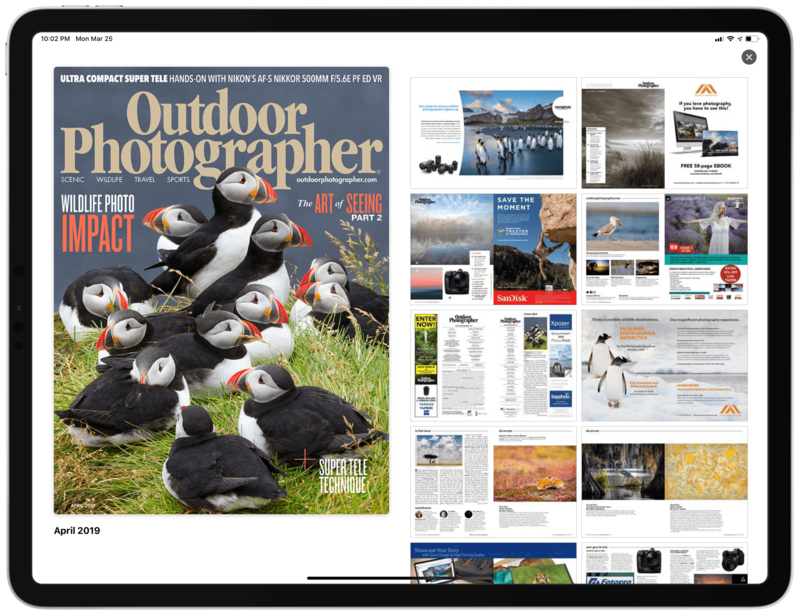 Billboard is one example: upon tapping on an issue of the magazine, rather than being presented with an "In this Issue" summary, you'll see a grid of pages, just like in any other PDF viewer or comic book reader. You can zoom in on pages, and you can select text, but you cannot resize text because each page is a static object; similarly, you cannot share individual stories from these kinds of magazines because pages are not associated with unique links. 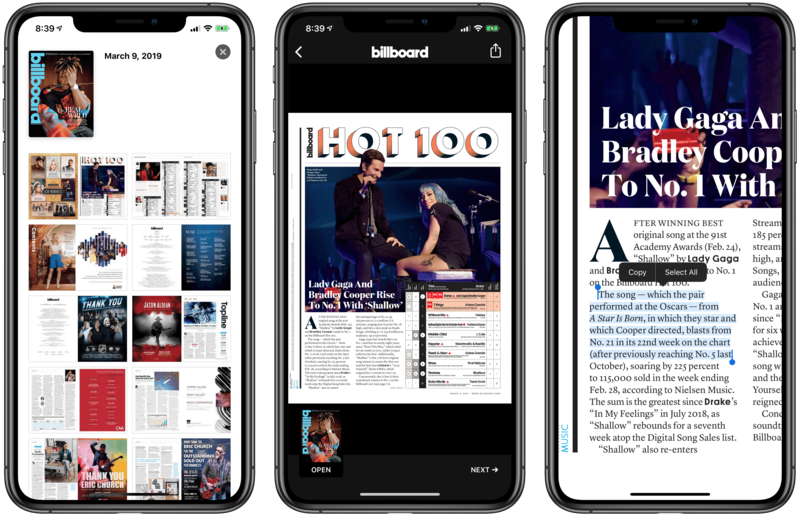 Billboard is one of the magazines that do not use the Apple News Format. Issues are made of pages that resemble a PDF document. Another example of a "standard" magazine in Apple News+. The experience, as you can imagine, is tolerable on iPad thanks to its larger display, but it's less than ideal on an iPhone, where, unless your genes provided you with accurate super-vision, you'll be forced to double-tap to zoom in on text content. And, of course, these non-optimized magazines will not support interactive elements such as galleries, animations, or media embeds. I have some reservations about the international rollout of Apple News+, and it remains to be seen how Apple's on-device intelligence will scale to magazine suggestions over time, but, as a user, I'm positively impressed by what's been launched today. Apple News+ is available today in the U.S. and Canada as part of the iOS 12.2 and macOS 10.14.4 software updates. The service will cost $9.99/month after a 30-day free trial, and, as announced by Apple today, it'll support Family Sharing, so up to fix family members will be able to access the service's catalog with a single subscription. To find out more about Apple News+ and start your free trial, you can visit Apple's dedicated mini-site here.